2012 Topps Heritage High Number Baseball provides a late-season addition to the main set's early release. Originally available as an online-exclusive, the box set comes with a complete base set and one random autograph. The 2012 Topps Heritage High Number Baseball set has 100 cards. 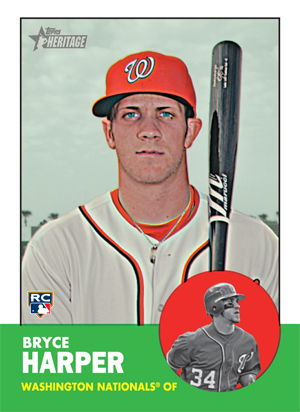 It updates the 2012 season with rookies like Bryce Harper. Traded players are also included. For example, Ichiro is pictured as a member of the New York Yankees. Each box set also comes with one autograph. 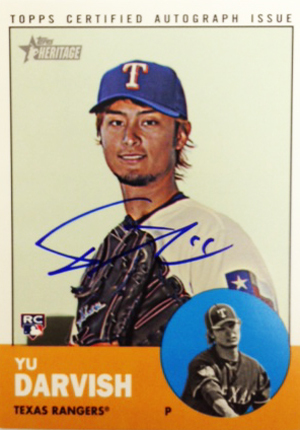 Signers include first-year standouts Harper, Yu Darvish, Yoenis Cespedes and Will Middlebrooks. Sticking with one of the brand's long-standing traditions, 2012 Topps Heritage High Number Baseball has randomly inserted Red Ink Autographs numbered to 10. 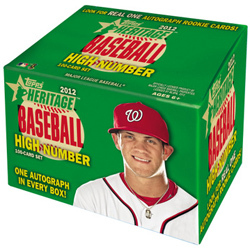 2012 Topps Heritage High Number Baseball is limited to 1,000 box sets. Sold through the online Topps store, sets carry an original price tag of $99.95. It still is only offered as an exclusive. More importantly, the links offered point to presells of sets w/o the autograph! The reality is that we can’t possibly LOVE everything that comes out. Additionally, sometimes we need to step back and look at what we’re really getting. First of all, this product looks pretty awesome. I dig Heritage, so I’m biased, but there’s quite a few disadvantages to “digging Heritage”. For one, it is REALLY hard to complete a set (including SP), so getting a “pre-built” Rookies and traded set to finish it off is awesome. I haven’t received mine yet, but I’m anxiously waiting it’s arrival to see which Autograph I got. EXCLUSIVITY: There’s only 1000 of these. Seriously. Think about that for a second. 101 cards out of /1000 for $100. That’s less than a dollar a piece and you’re not really going to find prices like that on much of ANY other /1,000 card in ANY set, let alone for a set of them. Finally: It’s like the perfect end to the set. There were lots of great inclusions to the Heritage set, but also a few VERY IMPORTANT exclusions (Harper, Yu, etc.). That is exactly what a “High Number” or “rookie and traded” set SHOULD do. Fill in the gaps and include late season additions. If I were to complain about any of the Heritage sets, my complaint would be the “minor league” set. Seems like something that should be “Bowman” country, not HERITAGE. The product may be fine, but the availability is awful. Only 100 sets were released, at $100. In 2015, they are scarce and the only one available online is $485. It is impossible to put together a 2012 Heritage Master Set. Jack Hoggard � Did you mean 1,000 sets? Either way, yes, it’s a tough set. I’ve still got an unopened one and doubt i will ever open it. There seem to very few that are still opened. Does anyone know how many Harper autos were produced? I’ve gotta believe there were way more Matt Hague and Willy Peralta autos than there were Harper, Cespedes and Darvish. I don’t recall the cost but know I purchased a set off ebay back in 2012. Glad I did as the Harper RC skyrocketed. Only regret was not buying two so the second set could go unopened. The print run was the big selling point. This set definitely was not “junk wax” as so many mid-1980s to early-mid 1990s cards.